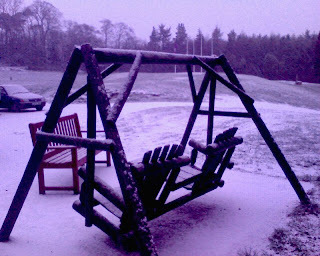 At long last, the much-awaited winter weather finally arrived at Fordell last weekend, much to the delight of the kids staying on site, and some of the staff of course.With only the Henderson Centre occupied (by a cub group) there weren't too many activities running (some also being cancelled or changed due to the weather). A late cancellation from a group up north meant that there were more staff than were required to run activities, so work progressed on a few ongoing projects as well. Starting slightly later than usual on saturday (an extra couple of coffees being essential to keep the cold at bay), the first task was to build a campfire for the crazy cubs to enjoy in the evening, despite the fact that the small campfire circle, and seats, were covered in snow and frost. 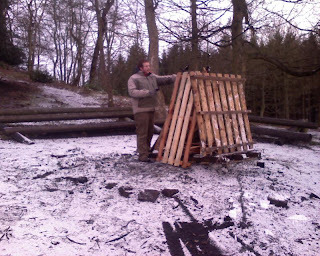 Survival guru Ginga, who once survived for 3 months at the North Pole living on only a single Tunnocks Teacake and 5 grains of rice, quickly took control and within 15 minutes had built a wonderful fire using his patented pallet-technique. Above : Ginga has a cunning plan to melt all the snow on the site. Campfire built, a short detour was taken on the way back to the staffhut to investigate the frozen pond at the back of the campfire circle. Despite initial appearances, the ice wasn't as thick as it appeared and a very minor rescue operation had to be organised when one of the plumper members of the Fellowship fell through the ice into the perishing (6 inch) depths. Above : Scott of the Antarctic taking risks. The cubs were still keen to take part in activities, despite the cold, and split into 3 teams for caving, challenge course and climbing. Caving wasn't affected by the snow; climbing was OK except for the temperature and the challenge course was just a bit more challenging than usual, some of the obstacles being out-of-bounds after being iced-up. Above : Cubs and leaders having fun on the challenge course. Above : Cubs arrive at Fordell to discover that the Henderson Centre isn't quite as big as it looks in the brochure. With the snow limiting what work could be done, all 6 staff ended up doing the same task in the afternoon, replacing the door at the caving complex. The plan was to replace the old solid wooden door with a metal mesh one - mainly to improve ventilation when the caves aren't being used. A couple of hours later, and despite everyone getting in each others way (not helped by a huge invasion of excited cubs midway through), the new door was fitted. Above : Fitting new caving door - 4 staff required...one to fit it, two to watch and one to get accidentally locked inside. Next task was for Bob to take some photos which will be used in new promotional brochures for the centre. Some of the cubs had willingly agreed to pose for photos of some of the activities, including the new traversing wall, circus skills, stilts, spacehoppers and slingshots. Everything went to plan with the exception of the stilts, which were a bit too tricky for the cubs - although the problem was solved by propping the cubs up against the wet weather hall wall (which may be cunningly photoshopped out for the brochure). Above : Auditions for 'Fordell's got Talent 2009' in full swing. Above : Cubs attempting to launch Bob into space. Sunday continued in much the same manner with a mixture of activities, odd jobs and copious amounts of tea and coffee consumed in the staffhut. Sadly the snow has pretty much disappeared now but it looks like there's a fair chance we'll see it back soon.